What are your top priorities for your growth and development as a Christian? If you are a parent, what are you emphasizing to your children to guide them into adulthood? If you are a youth group leader or mentor, what spiritual guidance are you offering to ground and direct those under your care. If you were on the Board of Trustees for a Christian college or seminary, apart from emphasizing education and developing skills, what would you most want the students to learn and to gain from their education at your school? In other words, how should we be preparing ourselves and the next generation of Christian leaders to make significant contributions in our troubled and needy world? Are our priorities right? 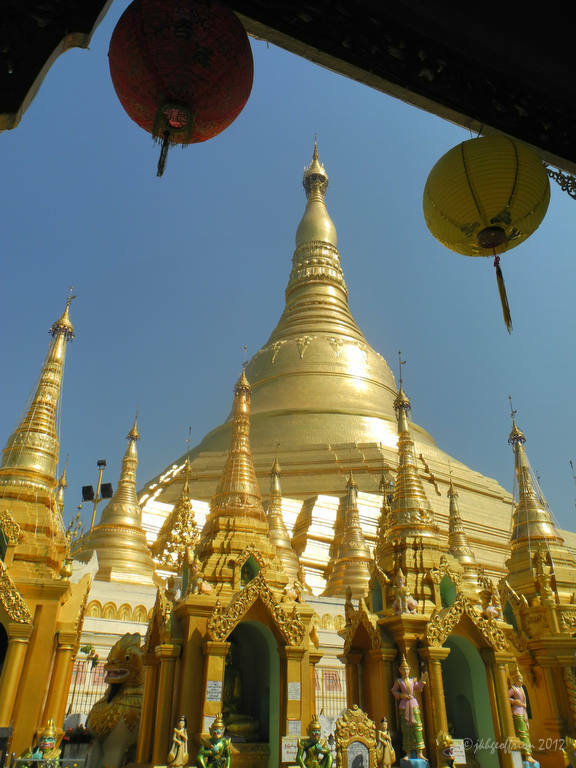 Recently, I was given the opportunity to answer these questions for the sake of the school where I teach, the Myanmar Institute of Theology (MIT), in Yangon, Myanmar (Burma). The school theme that I proposed for the academic year, “Growing in Christ, Preparing for Service,” was chosen by the MIT faculty members as particularly fitting for our 1200+ students. What follows below is the Bible study that I prepared to present this theme to the student body and all of our constituents. While the context is clearly a particular Christian college and seminary in Southeast Asia, this teaching applies to Christians everywhere. The writers of the New Testament insist over and over again that we need to keep our spiritual priorities straight—in our personal lives, families, churches, youth groups, and Christian schools. So much is at stake. 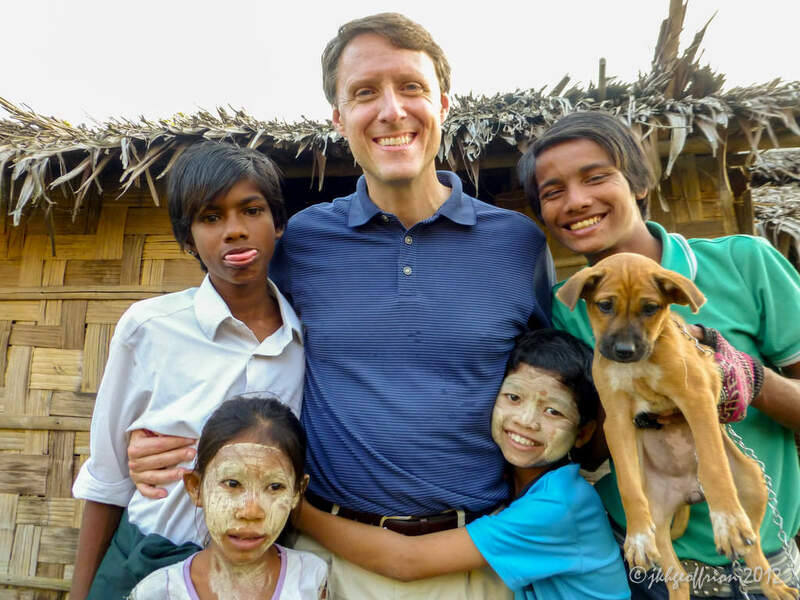 This year’s theme, Growing in Christ, Preparing for Service, is intended to concisely articulate the core theological and spiritual foundation of Myanmar Institute of Theology (MIT) and to remind us all of why MIT primarily exists. In other words, the primary purpose of this theme is to encourage MIT Liberal Arts Program (LAP) and Theology students, faculty, and staff to focus on developing their relationship with Christ as their first priority, and to humbly dedicate themselves to serving Christ, church, and country with greater knowledge, skills, and spiritual vitality. Drawing largely on Jesus’ teaching on the two greatest commands and on Paul’s interpretation of the Gospel, we can say that the primary purpose for every human being is to know, love, and serve God, who is revealed preeminently in Jesus Christ, our Savior and Lord. For Christians, this life purpose is not simply a matter of doctrine; it cannot be fulfilled just by believing or by being baptized. Rather, it requires growing in our relationship with Jesus Christ all our lives. Our vocation—that is, our unique work in the world—flows from this relationship into a lifetime of service, no matter what our particular position, assignment, or activity may be. 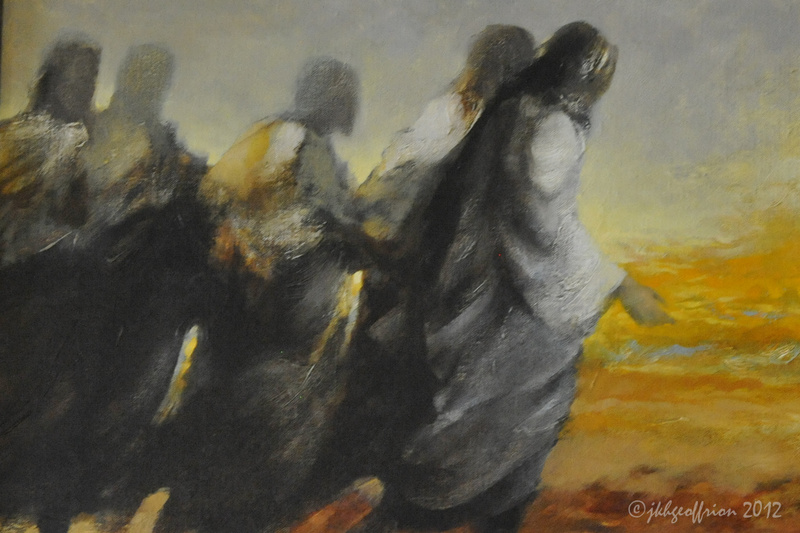 We may be called to serve primarily in the Church, the broader society, or simply at home with our families, but every Christian has the same general vocation to follow in the footsteps of our Lord Jesus Christ, who said of himself, “The Son of Man did not come to be served, but to serve and give his life…for many” (Mark 10:45). In short, then, our theme, Growing in Christ, Preparing for Service, draws our attention to our top spiritual priority of knowing and loving God in Christ more and more, and to MIT’s chief responsibility from a biblical point of view to prepare men and women to serve Christ and the Church in a wide variety of ways upon graduation. Our Bible study will take Paul’s teaching on the purpose of the Church and the significance of growing in Christ as our point of departure. We will then look how Peter contextualized Paul’s ecclesiology, teaching marginalized and persecuted Christians how they should live and serve Christ in a religiously pluralistic world, and what kind of preparation is needed to do so. Finally, a few comments will be offered on the relevance of this biblical teaching and theme to MIT. The Church was established by the preaching of the Gospel, the working of the Holy Spirit through its proclamation, and the common faith of those who put their trust in Jesus Christ for their salvation. According to Paul’s first letter to the Corinthians, believers in the Christian Gospel become members of the body of Christ, and together form the universal Church (1 Cor. 12). Further, God gave spiritual gifts to every member of the body of Christ (12:7). In his letter to the Ephesians, Paul focuses on a subset of the body to emphasize particular gifts given to those who are in positions of leadership—namely, apostles, prophets, evangelists, pastors and teachers, in order both to identify these leadership gifts and to discuss the purpose for which they were given. In general, Paul taught that God gives spiritual gifts among the members of the body of Christ in order that they may minister to, serve, and build up one another. In 1 Corinthians, Paul simply says that the gifts are given for “the common good” (12:7), meaning the good of the body of Christ (the Church). All believers in Christ have the responsibility to serve in ways that strengthen the body. Leaders have the additional duty “to prepare God’s people for works of service so that the body of Christ may be built up” (4:11-12). To be built up means that all the members of the body of Christ would “reach unity in the faith and in the knowledge of the Son of God and become mature, attaining to the whole measure of the fullness of Christ” (4:13). When the body of Christ is mature, they “will no longer be infants,” liable to being misled and confused by false teaching (4:14). Instead of being crippled by instability and division, they would “grow up into him who is the Head, that is, Christ” (4:15, emphasis added), as the whole body “grows and builds itself up in love, as each part does its work” (4:16, emphasis added). In Paul’s vision for the Church, everyone is expected to keep growing in Christ and to be actively serving one another for the common good and the upbuilding of the whole Church. If we have accurately summed up the priorities for the body of Christ as a whole, how much more important is growing in Christ, preparing for service for the Church’s future leaders. When we turn to the Apostle Peter’s teaching, we see how he contextualizes Paul’s teaching on growing in Christ for Christians who were marginalized by the broader, religiously pluralistic society and sometimes even persecuted for their faith. In the face of such hardship and danger, he urged Christian believers to go deeper into their own relationship with God in Christ, to strengthen their self-understanding as the people of God, and to prepare themselves intellectually as well as spiritually, morally, and behaviorally, so that their witness to their largely nonChristian neighbors would be more clear, vibrant and persuasive. They were not to shy away from suffering for Christ. Yet, at the same time, they should avoid unnecessary persecution (that which comes from outright rebellion or immoral behavior) and live exemplary lives for all to see. He urged them to “live such good lives among the pagans though they accuse you of doing wrong, they may see your good deeds and glorify God on the day he visits us” (1 Pet. 2:12). To live up to our calling and to the demands of serving Christ requires ongoing spiritual growth and development. So, Peter says, “Like newborn babies, crave pure spiritual milk, so that by it you may grow up in your salvation, now that you have tasted that the Lord is good” (1 Pet. 2:2-3, NIV, emphasis added). Peter writes elsewhere, “grow in the grace and knowledge of our Lord and Savior Jesus Christ” (2 Pet. 3:18, NIV, emphasis added). He knows well that his readers already have experienced the grace of God and know the Lord Jesus Christ as Savior. Yet, he also knows that the Christian faith calls us to keep growing in our knowledge and experience of God in ever-new and more meaningful ways. Throughout his letters, Peter gives many practical teachings on what it means to grow spiritually and prepare better for Christian service. In one place, Peter urged his readers, “In your hearts set apart Christ as Lord” (1 Pet. 3:15a, NIV). Acknowledging Jesus Christ as our Lord, or leader, is not something a believer does just once at baptism. Rather, surrendering to the lordship of Christ is ongoing struggle and process that continues throughout our lifetimes. This, too, is an important part of growing in Christ. According to New Testament writers, accepting Christ as our Savior and Lord is an essential turning point in our spiritual journey, but it is only that—a significant turning point (not, endpoint). Bending our knee to Christ as Lord repositions us to eagerly pursue a fuller and more significant relationship with Christ on an ever-deepening basis. 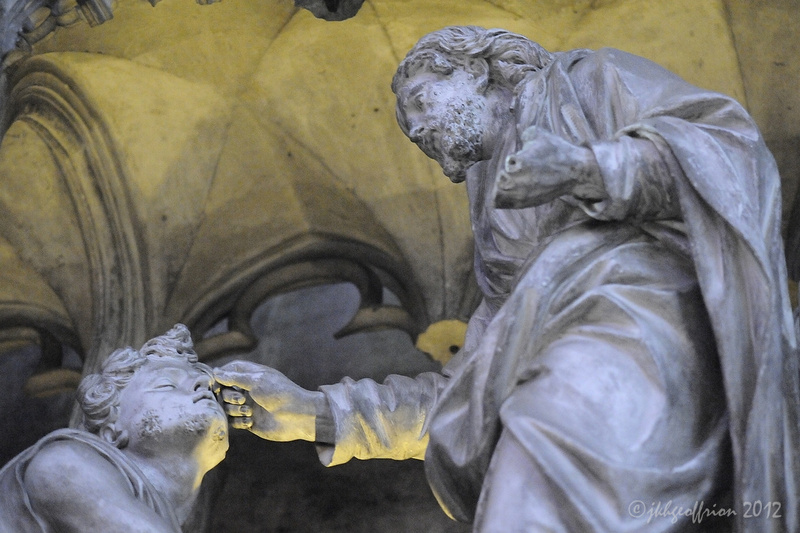 Then, as we grow, Peter tells his readers, “always be prepared to give an answer to everyone who asks you to give the reason for the hope that you have” (1 Pet. 3:15b, NIV). Here Peter calls Christians to keep growing intellectually and to develop communication skills to talk about their faith (and not hide or minimize it) with those who don’t know Jesus Christ. And so forth. In sum, Peter teaches Christians how they should think of themselves and respond to nonChristians in the face of marginalization, misunderstanding, ignorance, and even persecution in a religiously pluralistic context. They are to neither hide from nor belligerently fight against those who oppose or mistreat them. He didn’t advise them to change their theology or view themselves as inferior to the majority and the powerful. Instead, they should sharpen their self-understanding as “a chosen people, a royal priesthood, a holy nation, a people belonging to God, that [they] may declare the praises of him who called [them] out of darkness into his wonderful light. Once [they] were not a people, but now [they] are the people of God; once [they] had not received mercy, but now [they] have received mercy” (1 Pet. 2:9-10). Then they should learn how to better reflect their faith, hope, and love to the nonChristians surrounding them in intelligent and positive ways. In short, the best response for Christians in a hostile, religiously pluralistic setting is to keep growing in Christ and to prepare themselves to serve both within the Church and within the broader society. So, how does this Bible study apply to MIT? Just this. 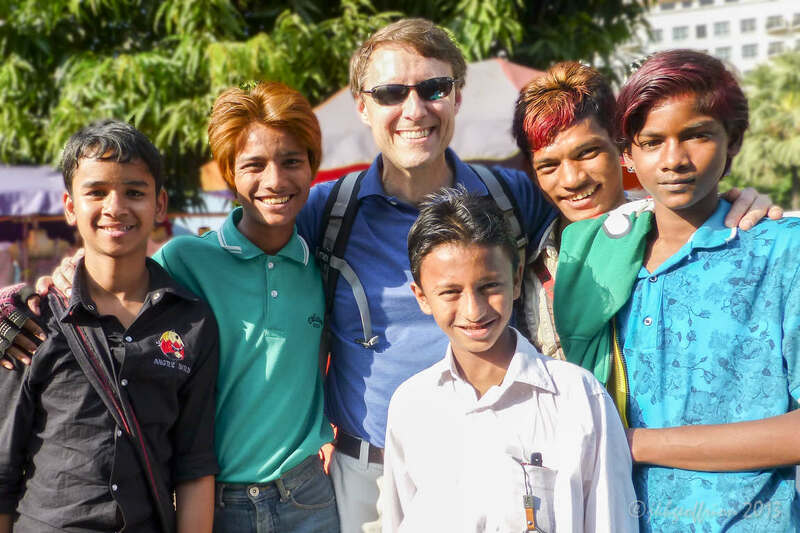 For MIT to fulfill its duty to Myanmar Baptist Convention (MBC) and the churches it serves, we must be diligent to teach our students how to grow in Christ. We must adequately prepare them for a lifetime of service. And, since many MIT graduates will be given significant opportunities to lead in the Church and society, we must also teach them how to lead and how to help others to grow in Christ and to be humble, faithful servants of Christ. You may be wondering, does this Bible study suggest that growing in Christ should come at the expense of academic excellence, sharing the Gospel, participating in inter-faith dialogue, or working to address societal ills and needs? No, not at all. All these endeavors and missions remain important objectives for Christians, and especially for MIT students and graduates. Yet, growing in Christ is the most important priority, and is the pre-requisite for all our intellectual, academic, mission, and societal activities. Why? Because Jesus taught that the only way we can hope to bear fruit in our lives is by maintaining a close (“abiding”) relationship with him (John 15). Paul and Peter taught the same thing, as we have briefly seen in this Bible study. They only added that our personal relationship with God in Christ needs to keep growing and deepening as well. They taught that we must become more and more like Christ and learn how to relate better to nonChristians in a religiously pluralistic world. The implications of this Bible study for MIT, as well as for the broader Church in Myanmar, seem obvious. The Church’s current leaders (including MIT faculty and staff) would teach, preach, and model the importance of growing in Christ as the top priority for Christians and the essential pre-requisite for everything we want to do in the name of Christ. Throughout the school year, MIT would actively promote the spiritual life of students, faculty, and staff (helping each one to grow in Christ) while organizing the school’s curriculum and student activities with the ultimate purpose of a MIT education in mind, namely, to prepare future leaders to serve Christ faithfully and fruitfully in their various leadership roles. Future leaders (including MIT students) would embrace these priorities for themselves and take personal responsibility to pursue them in every way they can. May God bless MIT and all the churches that support and are served by MIT as, together, we keep growing in Christ, preparing for service. See, e.g., Acts 2; Rom. 1:15-16; 10:6-17; 1 Cor. 15:1-11; Gal 1:1-9; 3:1-5; 4:4-7. Eph. 4:8-11; Cf. 1 Cor. 12:1-10; Rom. 12:4-8; 1 Pet. 4:10-11. 1 Pet. 1:5; 2:4, 11; 3:14; 4:12-16. 1 Pet. 1:13-16; 2:5, 9-17, 19-21; 3:8-16. In its most simple form, Spirit-led living is listening to the voice of the Holy Spirit, and then cooperating as fully and quickly as possible. Listen and cooperate, listen and cooperate, in one situation after another. Step by step, a long string of saying, “Yes,” to the Holy Spirit becomes a Spirit-led life. The concept of “cooperation” with God, normally emphasized by the Catholics (to describe the proper use of a regenerated human will) is sometimes shunned by Protestants (to some, it sounds too much like works-righteousness). Yet, in using the concept here, I am not talking about relying on ourselves to do the will of God in our own strength, but rather utilizing our human faculties to “go with the flow” of the Spirit. The Apostle Paul teaches that our wanting and having the capacity to do what pleases God—our ability to cooperate—is not from ourselves but actually comes from God (Philippians 2:13). Yet, in our experience, our cooperation feels like dropping our resistance, submitting to God, or actively embracing whatever the Holy Spirit is putting before us. Spirit-led living, then, means taking the action that flows naturally from whatever you hear the Spirit say. A simple model to grasp, to be sure, but not so simple or easy when it comes to putting it into practice. Why? But first you have to be listening, and to listen, you have to be in a state of mind that is truly open and ready to hear what the Spirit wants to say. Learning to get your own self out of the way, to quiet the competing voices in your head, to be willing to stop and change course, to be patient to wait for the voice of the Spirit, or to be willing to step out of your comfort zone is hard work. You may feel uncomfortable or unsure of yourself when it comes to listening to the Spirit. You may not be sure what is the voice of the Spirit and what is your own voice. But you can learn. Lately, my workshop for learning how to better listen and cooperate has been on the streets of Yangon. Talk about challenges and the need for the Spirit. I work with at-risk youth when I’m not teaching seminarians or doing leadership training, and I frequently find myself over my head. Between being overwhelmed by their physical needs—extreme poverty, hunger, and stressful living conditions—and trying to navigate all the lying and manipulation, my head is often swimming. I often don’t know what to believe or what to think, let alone what to do. Listening to and cooperating with the Spirit have been critical to my ability to truly make a difference in the lives of these kids, not to mention preserve my sanity. When I start to get frustrated and uptight, sometimes I hear, “Relax. Just enjoy the kids. Let them experience God’s love through you.” Or, “Listen to their stories. See their hopelessness and desperation. What would you do if you were in their place?” My heart opens again, and I feel God’s compassion surging through me. Not infrequently, when everything seems to be deteriorating or going backwards, I suddenly realize that we’re in the midst of a teachable moment. Yesterday’s disappointment, frustration, and discouragement have laid the groundwork for having a meaningful conversation today about responsibility, values, or relationships. The Spirit helps me to see that it is not only appropriate to confront them, but doing so turns out to be the most loving and constructive thing I could offer them. I look around and see some people getting taken in and used by these kids. Others who have been trying to help them over the years have become so disappointed and burned that they want to walk away. Listening to and cooperating with the Spirit have helped me to avoid the extremes of naivety and cynicism. The Spirit helps me to stay calm, to be willing to step back when I have no idea what to do, and to wait until I can see more clearly what is needed; but to not lose heart or give up. U Zaw (pronounced oo zo) teaches and mentors poor, teenage boys who work for Helping Hands, a small social service program in Yangon, Myanmar. Annie Bell, the wife of an British diplomat, started this skills-development outreach several years ago. A deeply compassionate woman, Annie has generously opened her heart and home to these boys and to many other individuals in response to the overwhelming poverty and needs that surround her. 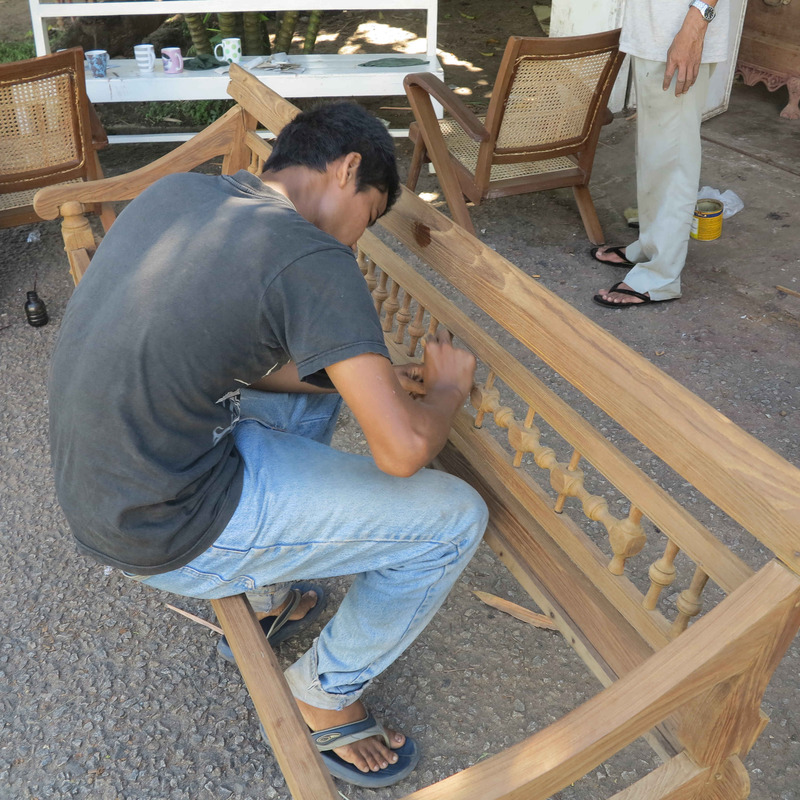 As Annie’s right hand man, U Zaw is responsible to teach 20 boys and young men how to refurbish furniture for resale. He’s there to help them develop marketable skills; and, just as important, he quickly adds, character. Most of those who work at Helping Hands are fatherless, with huge voids in their lives. 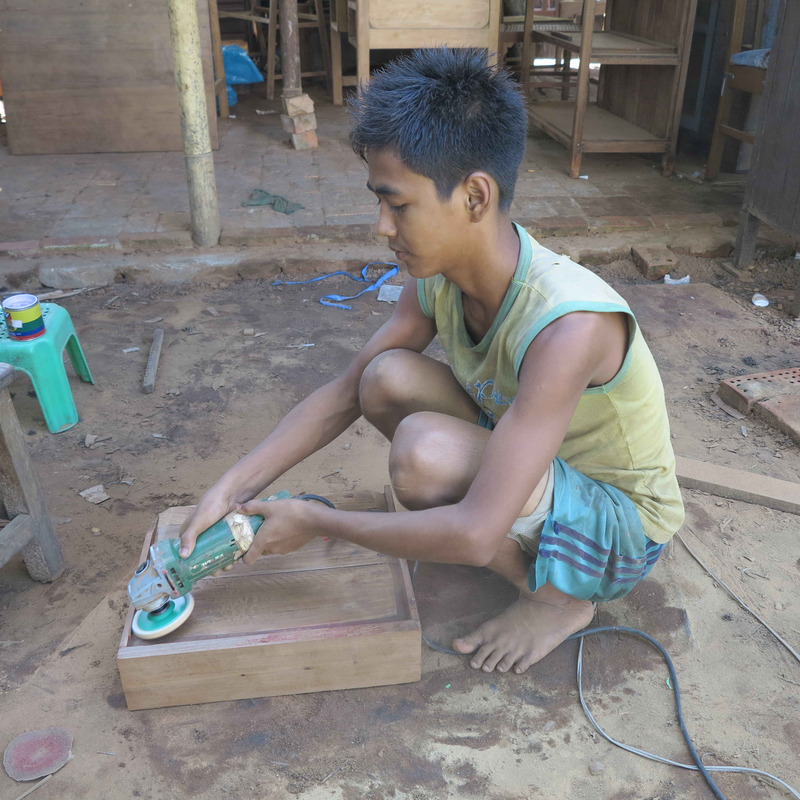 U Zaw is genuinely concerned for each boy, and takes his mentoring role very seriously. 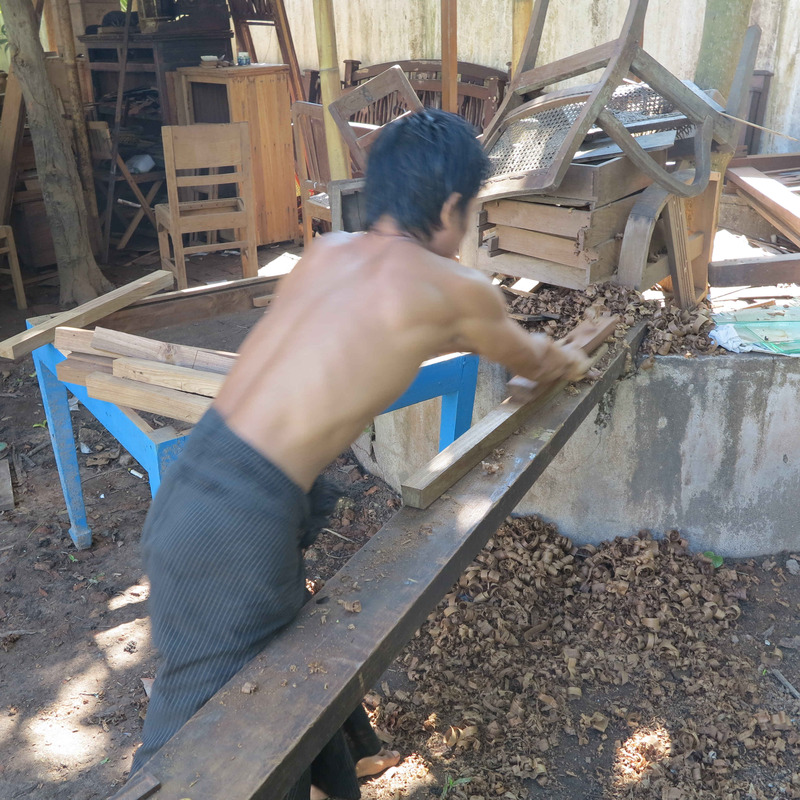 As a Christian, U Zaw’s faith is very important to him and is a source of inspiration for his work. I was surprised by his low impression of his own spiritual life. Love for these kids oozed from his pores, and his dedication was manifestly obvious; but it was his wife that he praised. She is the one who truly loves Jesus, he told me somewhat sheepishly. She is the one who is committed to the church, he explained, obviously self-conscious about his own minimal participation. 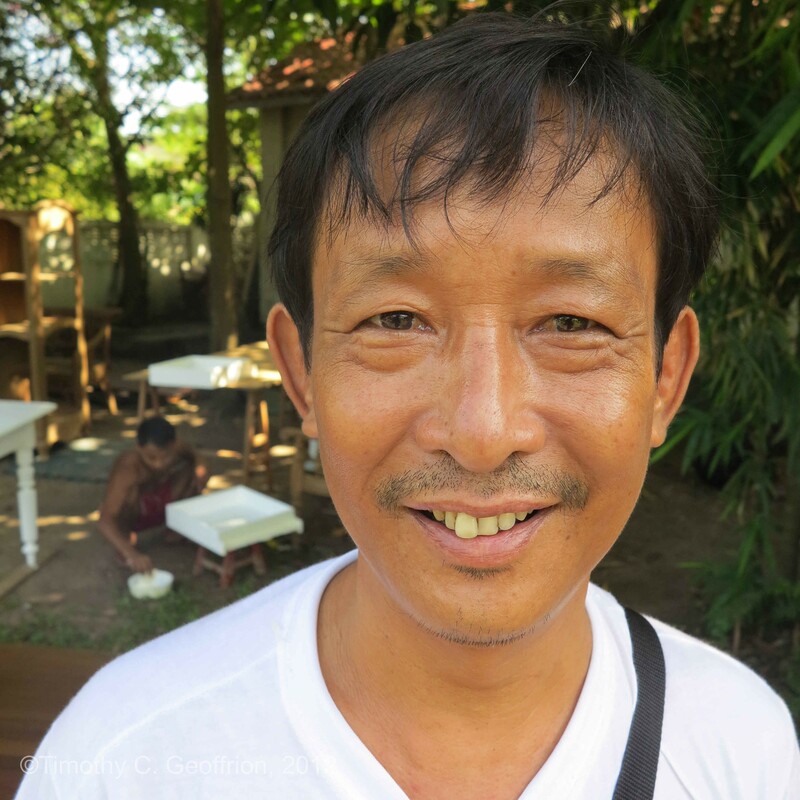 U Zaw works six days a week and rarely has time to even attend a weekly worship service, let alone any other church activity. He clearly feels bad about his lack of church involvement. We only had a few minutes, but there was no way I was going to walk away without commenting. The measure of our spiritual vitality goes well beyond what we believe or how much time we spend in Bible Study or church. Spirituality is also—maybe chiefly—about how we live out our faith between Sundays. I had to tell him what I saw in his love and dedication for those kids, that his heart and actions shouted a living spirituality and were beautiful expressions of what it means to follow Christ in ordinary life. Sandra Schneiders, professor emerita in the Jesuit School of Theology at the Graduate Theological Union in Berkely, California and pioneer in the academic study of spirituality, captures well the interplay of belief, relationship to God, and relationship to the rest of humanity. Schneiders defines spirituality as one’s “lived experience” of faith. Spirituality, then, is not just belief, on one extreme, or a collection of religious experiences, on the other; and it certainly isn’t the accumulation of religious activities. Rather, our spiritual life is grounded in God’s activity on our behalf, is enlivened by our response of faith, and is marked by our experience of seeking to live out the faith in myriad ways, affecting every dimension of our life. Please don’t misunderstand me. We need to worship, and we need spiritual disciplines to strengthen and encourage us as we seek to follow Christ. Personally, I depend on guidance and inspiration from reading my Bible, fellowshipping with other Christians, singing, worshipping God, and praying. Yet, between Sundays, the real measure of our spirituality is in how we live out our faith in the context of our daily life. It’s in how we fulfill our duties and responsibilities, and in how we treat one another. We must resist the temptation to measure our spiritual maturity by how much we’ve learned intellectually, how many spiritual practices we observe, or even how many spiritual “highs” we may have experienced. Instead, what matters most is how much we let the love of God move us and flow out of us toward others. 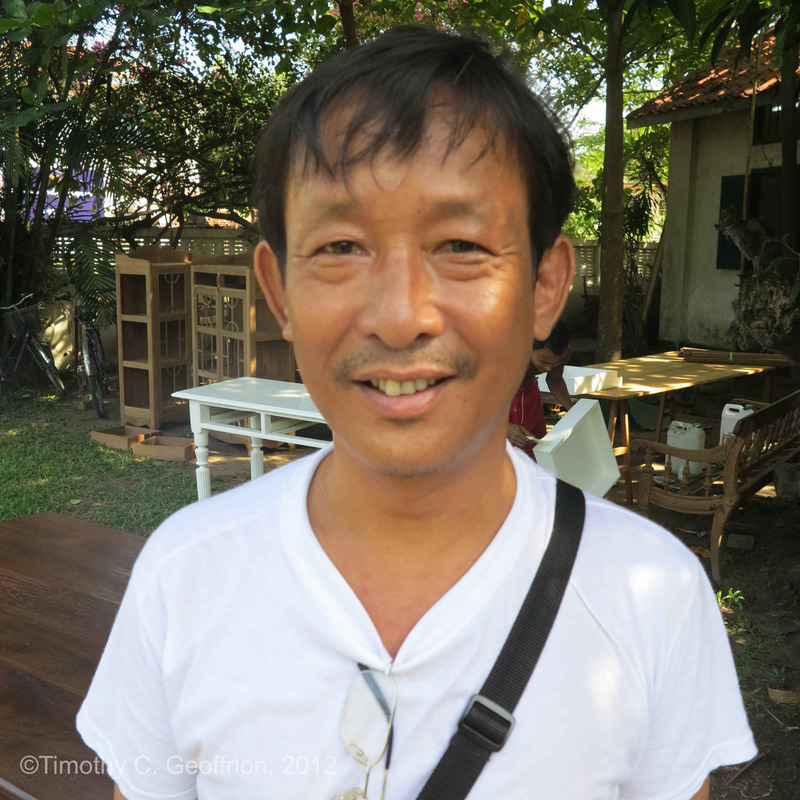 As I turned to go, U Zaw began shaking my hand vigorously, a huge smile spreading across his face. It was apparent that no one had ever explained to him what spiritual vitality looked like in the life of a humble, sincere follower of Christ. “You must come back and talk to me again!” he insisted. “I want you to meet my wife, too!” I would be happy to do so, I thought. You’re just the kind of person I want to be around. Sandra Schneiders, “The Discipline of Christian Spirituality and Catholic Theology,” in Exploring Christian Spirituality: Essays in Honor of Sandra M. Schneiders, IHM,” ed. By Bruce H. Lescher and Elizabeth Liebert (New York: Paulist Press, 2006), p 200. Adapted from my book, One Step at a Time: A Pilgrim’s Guide to Spirit-Led Living (Herndon, Virginia: The Alban Institute, 2008), p. 6. On the eve of my return to Southeast Asia, I am looking forward to more conversation with my students and colleagues on the way of Jesus in a predominately Buddhist context. 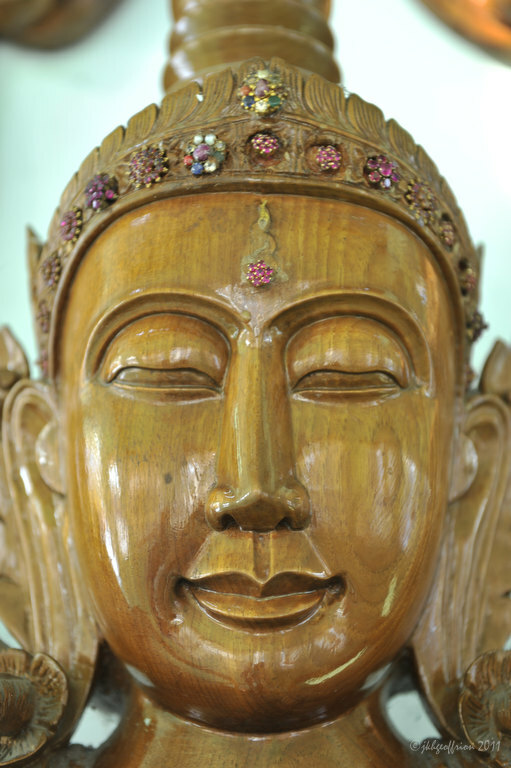 Like Jesus, the Buddha is usually portrayed as a gentle and wise spiritual guide. By following his teachings and example, in pursuit of enlightenment and liberation from this world, Buddhists seek to detach themselves from all those desires that produce suffering. 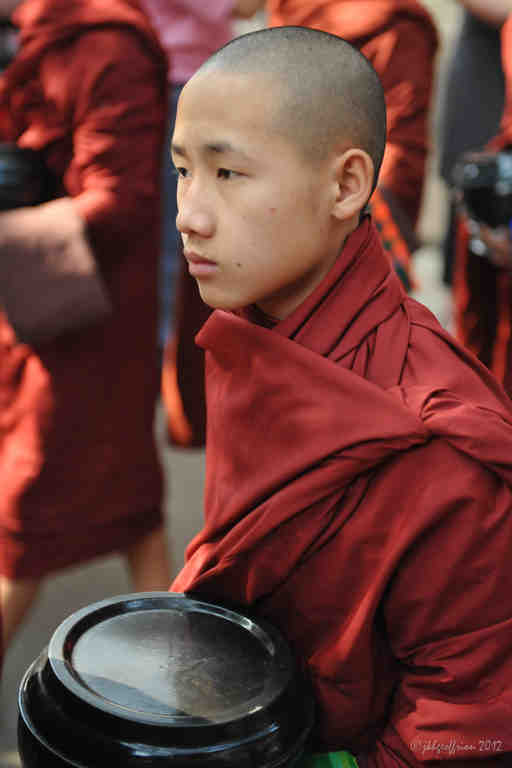 Along the way, they seek to live peacefully and to become more compassionate toward others. Buddhists don’t expect these changes to happen overnight, to say the least. In fact, according to common Buddhist teaching, full enlightenment will probably require thousands of (re-) incarnations, if it ever happens at all. As Buddhists look to the Buddha for a better way to live and for hope for their lives, so Christians look to Jesus. Yet, Jesus’ way is different. Rather than starting with the individual, or even the community, Jesus started with God. He taught us to put the Creator and giver of life at the center of our lives, and to seek to know, love, and serve God with all of ourselves. His Gospel was an invitation to increasingly experience God’s love filling us and flowing through us in ways that truly make a difference in the lives of those around us. In this way, God would be glorified in his creation, and we would experience life as God intends. Jesus expected that those who follow him would make every effort to realize God’s vision for their lives, but he never imagined that we would try to do this in our own strength. At core, his message was not, “Try harder!” No, his good news was more radical than that. Jesus’ Gospel was a call to surrender our own will and self-reliance, so that God could do in us what we simply cannot do on our own. Followers of Buddha—or any religion or religious figure that teaches that we must somehow earn or achieve or own salvation—must forever operate under a different system from what Jesus’ taught. They hold a different basis for hope, and live out their days in an endless pursuit of something that is always out of reach. Followers of Jesus, on the other hand, start by capitulating. They give up the vain aspiration to reach the top of the spiritual ladder in their own strength—no matter how well-intentioned or noble the path. Instead, they gratefully rely on the mercy of God, submit to the yoke of Christ, and learn how to live by the leading of the Spirit of God. Jesus said, “Come unto me all you who are weary and heavy burdened, and I will give you rest. Take my yoke upon you, and learn from me, for I am gentle and humble of heart, and you will find rest for your souls. For my yoke is easy and my burden is light” (Matthew 11:28). An obscure image for most of us, perhaps: a young, untrained ox paired with an experienced, disciplined partner. Once yoked together, the younger one follows the lead of the older, and stops resisting the farmer and exhausting itself. Suddenly there is less stress and distress than when it was fighting against the farmer’s will. And the field gets ploughed. Jesus is giving us a picture of a relationship with God that is very different from one that requires our striving to some how pull ourselves up by our own bootstraps. Jesus is offering to gently lead us into the true life God intends for us, both by what he does for us and by what he shows us to do. The way of Jesus makes him stand out from other great religious leaders, and his teaching from other spiritual paths. The key difference is not so much the intended goals of a becoming a better person, of creating a better society, or of attaining a better after-life. Most religions agree on much of this. No, the critical difference between Jesus’ way and all the others is how one gets there. By being a follower of Christ, I don’t think I am better than others. On the contrary, I am keenly aware of how limited I am in my own power to become the person I would like to be. I accept this reality, and look instead to God’s love and acceptance for my sense of worth. I rely on God’s mercy and grace for forgiveness and redemption. And my spiritual journey is fairly simple—I’m seeking to learn what it means to live under the yoke of Jesus and live by the Spirit day-by-day, moment-by-moment. I take credit for nothing in my relationship with God, and am only grateful that I was given the grace to recognize the truth that would finally set me free. Matthew 22:37-40; Luke 15:11-32. See, too, how John further develops this Gospel message, 1 John 4:7-19. Benefiting from Buddhism is a series of articles on how to learn from and grow through interaction with those who think, believe, or live differently than we. In the first article, “How do Christianity and Buddhism Mix?” we looked at our different options. Do we want to be Blenders, Borrowers, or simply Inspired? In the second article, “What is an Authentic Spiritual Journey?” we talked about the importance of honesty, openness, intentionality, and eagerness for those who are serious about spiritual growth. But the question remains, how open should we be? For the Christian who already believes that Jesus is the way, the truth, and the life, what is the real goal of being open? And, what kind of openness is appropriate for Christians and truly fruitful on an authentic spiritual journey? What is the Holy Spirit saying? Contrary to what you might think, staying open in the midst of a conversation is less about the thoughts, beliefs, and feelings of the other person and more about God. While each of us has so much we can learn from other people who think differently than we do, the priority is on listening for what the Holy Spirit wants to say or do through the encounter. When you are sensitive to the Holy Spirit in interpersonal relations, you are likely to become more understanding and less judgmental. You will feel more compassion and want to respond to that person with respect and kindness as a fellow human being. The Holy Spirit is not going to prompt you to water down your commitment to Christ, but may show you something you would not have seen or thought of otherwise. The Spirit may also remind you of a truth in Scripture or in your faith that you have forgotten or put aside, but now need to take hold of once again. By being open to the Spirit in such circumstances, the possibilities for God to work in your life are limitless. For example, within just the past couple of months, the Spirit spoke to me very meaningfully through encounters with Buddhists, Muslims, and an agnostic. An hour discussion sitting on the floor with a Buddhist monk in Mandalay reminded me (once again) to not assume I know what others believe just because of the clothes they wear or the label associated with them. His articulate philosophy inspired me to do a better job making sure others know the heart of my faith and life. Through a brief conversation in a small city square, a Muslim mother told me how she could manage raising five small children with her husband thousands of miles away in Pakistan. Her simple faith reminded me to look to God for strength to do whatever I’ve been called to do. An agnostic friend of mine blew me away with his ridiculous acts of generosity. He refuses to take credit and insists that he does what he does to meet some need of his own. But his example led me to prayer, to ask God for the ability (grace) to not let my fear and greed hold me back from giving more spontaneously and generously to those in need. Not one of these people read a verse from Scripture or referenced Jesus Christ, and clearly none of them would call themselves a Christian. Yet the Holy Spirit used the encounter to speak to me, to touch me, and to move me another step on my spiritual journey in ways that I deeply treasure. I’m not worried about being too open to others, because I know how much Jesus Christ means to me, and I am continually looking to the Holy Spirit to help me sort out and benefit from all that I am experiencing. However, I don’t want to suggest that you don’t have to be thoughtful and prayerful about listening to others. Talking with someone who articulately believes something different can be very disorienting, confusing, or troubling for many different reasons. Yet, rather than run away from the discomfort, and certainly rather than letting yourself just get swept away by every new idea that comes along, learn how to listen to the voice of the Holy Spirit in the midst of the encounter. The following are 10 suggestions that might help. Ask the Holy Spirit to prepare you to hear God’s voice through your encounters with others, and to lead you to the people you can learn from. Reach out to others. Sounds pretty simple, but most of us stay within our own little, safe circles. Seek out those who think or believe differently than you, and look for an opportunity to exchange views and experiences with one another. Ask God to help you to listen without judgment and to love without strings. The goal of an encounter is not to quickly size someone up, but to genuinely connect mind to mind, heart to heart, and soul to soul. Expect and ask for the Holy Spirit to speak to you through the encounter. Notice whatever strikes you as interesting or important in the conversation. Particularly take note of whatever is true, good, or beautiful, no matter who said it or who did it. Ask questions. Be curious. Seek better understanding wherever needed or wanted. Be ready to share with the other person how your faith in Christ and your experience with God have been a gift to you. Don’t use theological or formulaic language, but talk from your heart, as you would to a friend. What is true in your own relationship with God that is worth telling someone else about? Identify further questions or concerns for yourself that arise from the encounter. What do the ideas or feelings of the other person make you wonder about your own faith or life experience? Try to put your question into words. Actively seek out answers from reliable sources: Scripture, your pastor, mentors, or other trusted resources. Don’t stop with identifying your question. Look for answers. Pray your questions and concerns. In other words, hold up what is confusing or troubling you to God, and ask the Holy Spirit to guide you and work in you through the ongoing process of seeking greater understanding. Thank God for the gifts of the encounter. What were you able to offer the other person that brings you joy? What did you receive from the experience? What will you do next based on your experience—for the other person, for yourself, or for someone else? How open should we be to others? Open enough to receive everything the Holy Spirit may want to do in us or through us through the encounter. First of all, an authentic spiritual journey is the one that is, not the one we aspire to, not the one we create in our minds to fool ourselves, and certainly not the one we fake to impress others. We may feel scared to admit the truth about the quality of our relationship with God, but we don’t need to be afraid. Such honesty can actually be quite liberating, freeing us to build a more vital spiritual life upon a solid foundation—the truth. By letting go of pretense, we can more fully appreciate the love and grace of God, who forgives us and sets us free to truly love and accept ourselves. The more we stop worrying about what others think of us, and look instead to Christ, the author and perfecter of our faith (Hebrews 12:2), the more likely we are to find the way, the life, and the truth we are looking for (John 14:6). Upon a foundation of truth and grace, we are in a much better position to start out fresh on our journey to discover more of the riches that can be found in Christ, more understanding, more truth, more of whatever it is the Holy Spirit wants to show us or do in and through us. It is at this point—more honest, yet hopeful; flawed, but forgiven; humbled, yet empowered—that we must get our priorities straight. We must line up our actions with our deepest held beliefs and values. But what does an authentic spiritual journey look like? An authentic spiritual journey: A case study Son and grandson of Protestant missionaries, Hermann Hesse was dissatisfied with the emptiness and over-reliance on the intellect that he perceived in Western society and the Christian religion. In his angst he sought insight in psychoanalysis and Eastern religion. Finally, in 1951, as the fruit of his own quest, he published Siddhartha, an evocative novel that has since inspired and captured the imagination of millions around the world. His story traces the life-long, spiritual journey of a fictional character named Siddhartha, who is positioned as a contemporary of the founder of Buddhism, Gotama (aka Gautama, Buddha). As a true seeker, Siddhartha is willing to look for answers wherever he can find them, and to experiment with different ways of being in the world. He is trying to find the truth about life—not intellectually, but practically. He wants to know what truly makes sense in the here and now. Siddhartha sojourns with the ascetics for a few years, yet finds such extreme self-denial unsatisfying, and leaves their company. He welcomes the arrival of Gotama, and listens carefully to him; but, in the end, he cannot agree fully with his teachings, and chooses not to be one of his disciples. Siddhartha then swings from asceticism to self-indulgence in his search for truth and fulfillment. He plunges freely into the pleasures of sexual love, wealth, and luxury. However, eventually, the emptiness and the corroding influence on his soul from living so dissolutely drives him to take to the forest. There he lives the rest of his life very simply, in the company of a ferryman, who teaches him to listen to and learn from the river. By the time he grows old, Siddhartha concludes that love is the most important thing to pursue. He increasingly becomes disillusioned with any kind of teaching, with ideas, and even words themselves. Increasingly, he is drawn simply to “action.” Concepts, theories, and articulated philosophies are not as valuable as simply focusing on the manner in which one lives, and the affect one’s life has on his or her soul. Sadly, the intellectualism and spiritual barrenness of Hesse’s day obscured the relevance of the Christian faith for his life’s deepest longings and questions. So much of what he was looking for, and what he came to believe about the tremendous importance of love, simplicity, humility, and gentleness, was already right at hand had he only been able to experience the love of God and leading of the Holy Spirit. He went searching for truth but did not take Christ with him. The real contribution of the novel, in my opinion, is not in where Siddhartha ended up. The jewel of the story is not in Hesse’s blend of spiritual beliefs taken from multiple religions and his own imagination and experience, having created his own eclectic spirituality, as all “Blenders” do (see the first article in this series, “How do Christianity and Buddhism Mix?”). Rather, what inspired me was his portrayal of an authentic spiritual journey, as far as it went. Siddhartha faced his own dissatisfaction with life and religion as he knew it, and sought help and a better understanding. He thoughtfully and respectfully engaged those who thought differently than he. He was open to learning from others. He was willing to experiment with different ways to live out his beliefs and convictions. He was willing to change, and he didn’t stop pursuing the truth until he found what he was looking for. Or should we say, …until he found a way of being in the world that he could live with. You may not be satisfied with where Hesse’s Sidhhartha ended up on his spiritual journey, as I am not. Yet are you willing to search as sincerely and earnestly as Siddhartha did to find answers that truly “work” for real life, for your life and relationships, in the here and now? Final thoughts Different religions define their spiritual goals and methods differently, but every major religious tradition affirms what most of us know from experience: The journey necessarily involves movement and change, and little happens without a sincere and dedicated investment of ourselves in the process. From a Christian point of view, spiritual growth depends upon God as well as us. We can only grow by God’s grace and activity in our lives through Christ and the Holy Spirit; and our part is to seek to know, love, and serve God—and love our neighbors as ourselves—in ever deeper and more profound ways throughout our lives. An authentic spiritual journey, then, will be marked by honesty, openness, intentionality, and earnestness—and, over time, real growth in how we think, how we live, how we relate to God, and how we love. In Scripture, we’re also taught to seek union with God as our ultimate destination, to look to Christ as our guide, and to depend on the Holy Spirit as our source of strength and power. As we experience life-giving changes that reflect Jesus Christ and the fruit of the Spirit, we will know that God is at work, Christ is leading us, and that our efforts have been worthwhile. • How much do I want to grow closer to God and to live more authentically? • How could I be more honest, open, intentional, and earnest in my spiritual journey? • What help do I need from the Holy Spirit in order take the next step? Suggested prayer “Loving God, I know you are the source of my life and the only real hope that I have. I don’t want to live in pretense or with so much emptiness. Thank you for waking me up. Please take my hand now, and lead me forward on my spiritual journey. Show me what I can do, and must do, to live more authentically and to pursue you more wholeheartedly. Amen.” This posting is Article 2 in a series of articles on “Benefiting from Buddhism.” © Timothy C. Geoffrion, 2012. How do Christianity and Buddhism Mix? 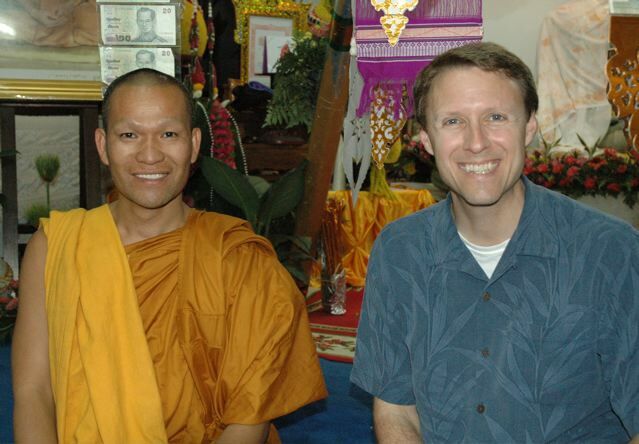 Since first interviewing Buddhist monks in 2007, I have become increasingly aware of the contributions of Buddhist philosophy and practice, not only for Buddhists but also for Christians. (See “What I learned from the Buddhists.” ) Now that I am teaching theological students in Southeast Asia on a regular basis, my interest in benefiting from Buddhism and in learning how to do contextual theology continues to rise as well. Intellectually, Christianity and Buddhism are largely incompatible, but just as Christians have something most Buddhists do not, Buddhists have something Christians often do not, or need more of. For example, how many Christians know how to effectively practice deep breathing in order to relax the body and reduce anxiety? How many know how to comfortably and confidently access their inner wisdom? How many have an ability to detach themselves from the desires and preoccupations that bring them suffering? How many genuinely value humility, patience, and mutual respect, in ways that actually lead to kinder, more peaceful relationships? Certainly, many Buddhists do not possess these qualities either, but as a well developed, psychologically oriented, practical philosophy, Buddhism offers many helpful tools that are not accessible to most Christians. Looking to the East is nothing new for occidental thinkers and seekers alike, though a concerted effort by Christian theologians to look to Eastern culture and religion for new insights into God and how God works is relatively recent. Yet, for many Christians, especially in the West, just the suggestion that we might have something to learn from Buddhism makes them feel uneasy, or outright furious. The notion flies in the face of traditional mission philosophy, not to mention (conscious or unconscious, stated or unstated) assumptions about Western cultural, intellectual, or religious superiority. So let’s talk about the issues. Our first question is: How can devoted Christians beneficially draw on the wisdom, insights, and practices of Buddhism (or any other religion)? I don’t mean, at this point, what are the specific benefits that Christians should seek? (I addressed some of these contributions earlier and will again in the coming articles.) Rather, here, we are focusing on, how should Christians think about encountering another faith? What are the options? What are the issues? 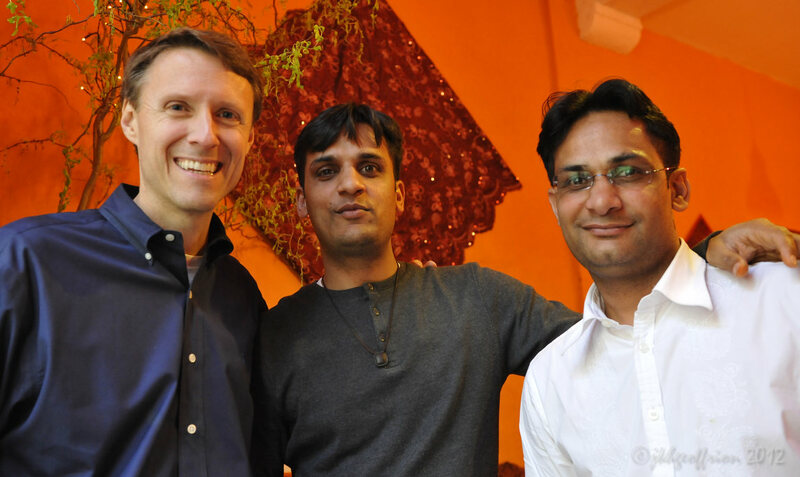 Among those who are truly curious, open, and willing to listen to those whose culture and religion are different than theirs, I see three different groups emerging. The Blenders. Blenders are eclectic syncretists, who consciously try to wrap their arms around both Buddhism and Christianity, thus creating a hybrid religion of sorts. Such individuals may call themselves Buddhist-Christians (or Christian-Buddhists), believing that, in spite of contradictions and tensions that exist between the religions, their spiritual experience is best explained or best advanced by embracing them both side by side, or some hybridization of the two. The Inspired. Then there are those for whom an encounter with Buddhism or another religion becomes a catalyst to look more deeply into their own faith tradition. They are inspired to see if they have missed something that may have always been there but has been lacking in their experience. Spiritual growth for the Inspired, stemming from the encounter with Buddhism, will still look, sound, and be very Christian, in the best sense of the term. Yet, at the same time, if you listen carefully, you will notice that the Inspired develop a larger, more inclusive worldview. They are more compassionate, sympathetic, and understanding. They care less about adherence to rules and traditions, and more about being “the real deal,” as one of my friends like to say about those who genuinely love God from their hearts and want to be an effective, fruitful servant of Jesus Christ. 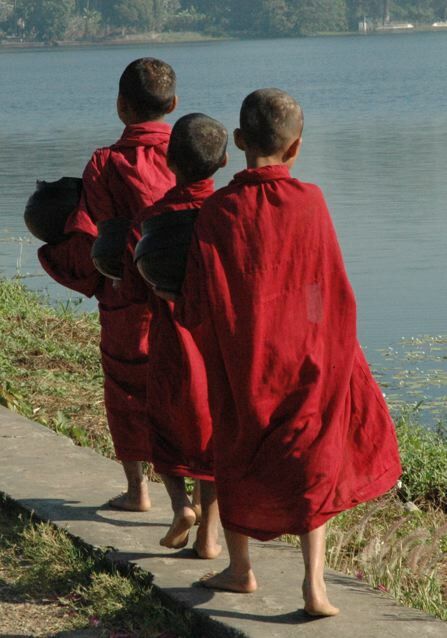 Does it matter which path one takes in seeking to benefit from Buddhism and other religions? I think it does. Regardless of whatever degree of syncretism may secretly exist in everyone’s faith and spiritual practice, Christians still have the responsibility to reflect on what they believe, why they believe, and where they are going to look for spiritual truth, wisdom, and power. Our view of God, of how we may know God and relate to God, and of how God works in human lives, will all greatly affect our beliefs, thoughts, feelings and actions. I am not talking just about intellectual reflection, but integrating reason and experience. In the end, every attempt to blend religions falls short of providing a secure spiritual foundation to build upon. I want to learn whatever I can from the wisdom and cultures found in the East, but Christian-Buddhist syncretistic blends tend to be so subjective that they resemble a host of individual, self-made religions. A Blender’s faith will likely depend mostly on his or her personal feelings and experiences in a vacuum, betraying fidelity to Jesus Christ in some way, and divorced Christian community reflection over the centuries, thoughtful examination of the implications of the competing worldviews, and a balanced interpretation of Scripture. The second route is less radical and seems fairly popular in some circles. Open to benefit from whatever might enhance their lives, Borrowers gratefully embrace meditation, yoga, ancient rituals, or anything else that they find helpful or meaningful in some other religion, but which is unavailable in their own tradition. Unconcerned about, or simply oblivious to, whatever underlying beliefs may be at odds with their Christian faith, they focus more on the immediate benefits of the borrowed ideas and practices that they are enjoying. I wonder, though, how often these “add ons” wind up being a distraction from spending time and energy seeking a more dynamic relationship with Christ and from learning how to live by the Holy Spirit. Personally, I feel more relaxed when I meditate, and my body feels better after yoga, but the most life-changing spiritual experiences I have ever had usually involve being consciously aware of God; heart-felt, honest prayer; or hearing God speak to me through Scripture. 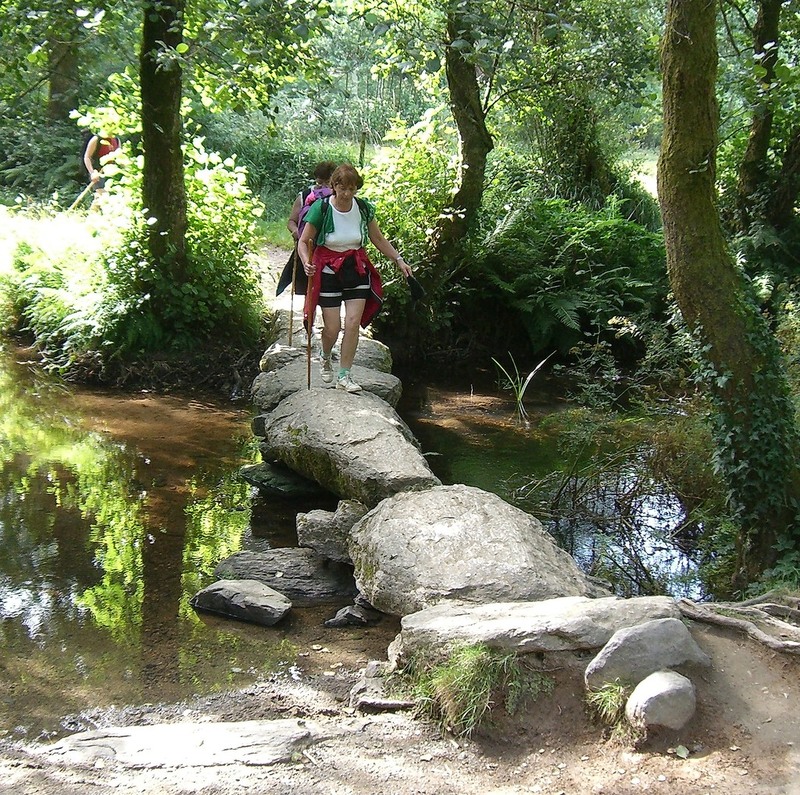 Most of the time, my journey looks like the third path. I’m on a quest for greater understanding about God, myself, and how human beings function and best flourish psychologically, socially, and spiritually. I am open to learn from any credible source, and will gratefully borrow insights and practices from other religions, providing they genuinely cohere with how the Spirit speaks to me through Scripture, prayer, and my relationship with God in Christ. I especially value dialoguing with those who offer alternative answers to ultimate and existential questions, because they help me to think more deeply and thoroughly. Yet, I do not journey as a lost soul. All along the way, I understand my identity as defined by my faith in and relationship to Jesus Christ. My quest is part obedience and part longing to better know, love, and serve God. I want to experience more and more of the abundant life Jesus offered to his followers, and if an encounter with different cultures and religions will help me to see something I’ve been blind to or ignorant of, I welcome the opportunity to learn and to grow. What about you? How do you seek to learn from “others” in ways that truly move you forward in your spiritual journey and relationship with God? © Timothy C. Geoffrion, 2012.